Where did you get these numbers from? I have been watching the Wii's being sold on Ebay for about a month now and I have yet to see many go for less than $300. In fact, over the last week or two the majority of them seem to be selling for $325-330. How did you compile your data? Your "article" gives no specifics about anything, with the exception of your ,ahem, very detailed graph. The above comment is off-base. If you're patient, you can get a Wii on eBay at/or around retail plus shipping. Most of the ones going for 300+ include an extra controller and games. There's still some exceptions, obviously, but I think the article is on point. To Robert Carroll....Wrong!!! I have been watching these auctions for several weeks now and what I originally posted is what I have witnessed for the basic system, no extra remotes or nunchuks (sp). The ones with the extra remotes and nunchuks (sp) are going for high 300's low 400's In fact, just tonight I have done a little research of nine different auctions and the result is an average price of $329.26. If you account for shipping of around $15.00, then you still have a price comfortably over $300. As for your comment about being patient, yeah if you can wait until January than I am sure you can find one for retail price. Unless you can demonstrate otherwise right now...which you probably can't. Had it been a new box I'd have done better but even my used one w/o any warranty fetched above retail. Anonymous - Thank you for your comments. The price in the chart above is the monthly average so far in December. The daily prices can definitely fluctuate and it does look like the daily prices on ebay are higher now than $250. But over the course of the month I think the prices are very close to this $250 price overall. There are also multiple Wii's listed on Half for less than $250 right now. I just checked all of the Wii's listed on Half.com and most of them less than $300 are no longer available. Where did you get your sample data? Was it only from Half.com or did it include auctions from Ebay as well? How many samples a day to you use? I think you methodology is flawed and your reporting suspect. This year I personally bought 9 Wiis and 4 Wii Fits. I sold 1 Wii for $320 (on December 27th), but the other 8 all sold for 350-360 consistently from the 2nd week to the 3rd week of December. 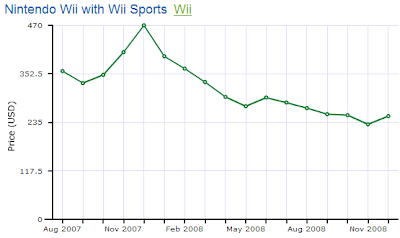 I also sold those Wii Fits for 140-170, with an overall profit of roughly $600. And now in 2012 they are barely selling for $70 so I guess the fad is over.